By accident - because Celebus is located exactly in the middle of "The Crease". Whenever a space fold collapsed, the traveling ship would land almost on top of the Celebus system. Now that... is damn cool. Your sci-fi concept is very interesting. In the movie Interstellar, they used a folded piece of paper to demonstrate the mechanics of folding space. The only difference between my model and their example is that they used a wormhole to connect the dots. I wrote this part of the story years before Interstellar came out so wormholes weren't really a science fiction thing back then, and yes, wormholes are fiction. There's little science behind them. The concept of falling into "The Crease" when folded time collapses is something I came up with for the basis of these stories. I think 'the gods' are amusing themselves. Can a nonaccidental trip be made there? And more importantly made away? Yes the fold can be intentionally collapsed just as SIGNOS did to get them there. 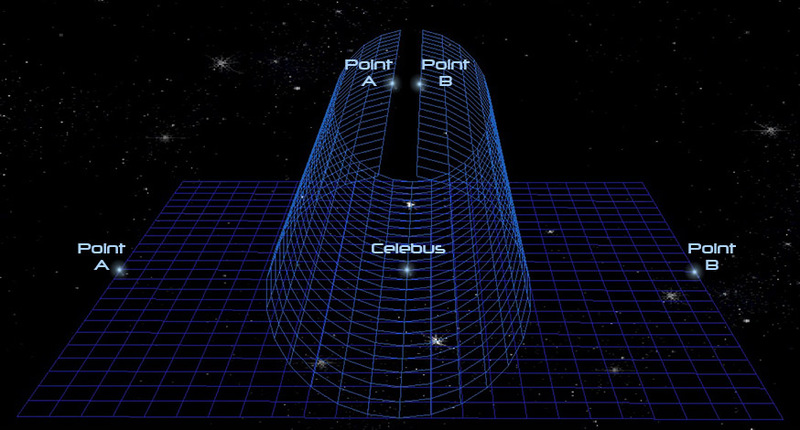 But you would have to find a way to generate the massive amount of power needed to bend the space between point A (or point B) and Celebus to get back... so basically they're stranded. Unless a space fold generator ship got lost there. After all those things have to get out there somehow.